Little Miss requested she pick out all her foods for lunch again tomorrow. :) I happy obliged, of course! I'm always intrigued to see what she'll pick out and what she's got planned, lol... She gave me her list pretty quickly, as if she'd been contemplating it all afternoon! Love it. 1/2 a Nut Free & Gluten Free Udi's Bagel Sandwich, with Nitrate & Gluten Free Turkey Slices & Cheese. Tucked beside it are Veggie Chips. The other side has raisins, apple slices, and a silicon bear shaped container filled with SunButter for dipping. There's a separate lidded container with cottage cheese. 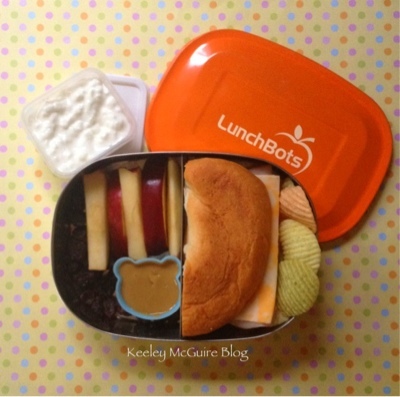 Lunch is packed inside a LunchBots Duo container.